With artificial intelligence (AI) gaining ground, the right contact center infrastructure (CCI) can be the critical business differentiator for long-term flexibility and scalability. 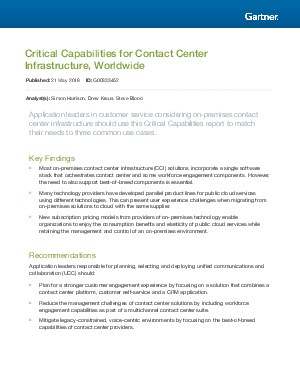 Gartner Research looked at three use cases to evaluate CCI vendors, and Genesys received the highest use case scores (4.16 out of 5) for Customer Engagement Center in Gartner Critical Capabilities. In fact, Gartner has named Genesys a leader in Contact Center Infrastructure 23 times—and counting. Our deep integration with CRM systems and support for digital channels enables a single view of the customer that is essential for an organization’s success.